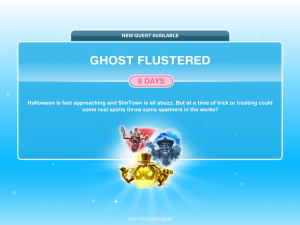 Ghost Flustered is a time limited Special Event being run during Halloween 2018. Complete Ghost Flustered to unlock Body Paints and a whole heap of sleepwear. 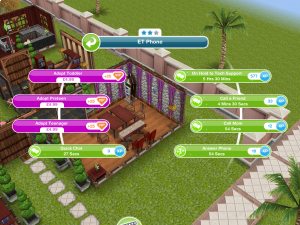 Head to any house with a phone in it and tap and select the 'Answer Phone' option to complete this task. If you don't have a phone then tap the chair and light icon at the bottom of the game screen, select furniture then the remote control icon, you'll find all the phones in there! 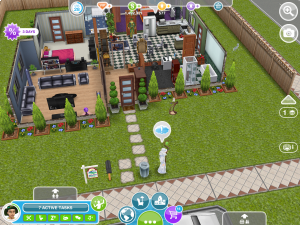 Head to the garden of any Sim Lot and look for a cloud icon, tap it and select the 'Search' option. Head back to the map view and tap the Park to go there. Once there, whistle for a Sim to come to the park, that will complete this part of the Quest. Head back to your home lot and the wizard should still be there. Tap him to start this task and select the Stop Ghosts Option. At this point you will earn the Red Body Paint. To get it tap the Body Paint tab in the Wardrobe in a home lot and select the red body paint color. You are about 20% through the whole Event now. Tap the body paint tab in a home lot and select the red paint color. To get there, you need to tab a wardrobe, then select browse clothes, tab the wardrobe icon at the top and find the body paint box tap that, then select the red one. When you have done that, this task will be completed. To do this, you need to stand with 5 other Sims (If it doesn't work try using only Adult Sims) outside a lot, tap a your character that has the red body paint on and select the Trick or Treat option.